As a sub-brand of BMW, BMW i represents innovation, technology, and of course performance. The all-electric BMW i3 and the plug-in hybrid BMW i8 are the first-ever of their kind, changing the way people think about driving while turning heads along the way. At the end of the day, these aren't just any other electric vehicles, these are BMWs. Using a prominent billboard space in downtown Boston, we took the infamous sports rivalry between Boston and New York to highlight the silent nature of the all-new, all-electric BMW i3 in a way that every Bostonian could appreciate. In this energetic 15 second digital short we put an interesting twist on the mpg of the BMW i3 while showing that this electric vehicle is still very much a BMW. Going all-electric doesn't mean you have to sacrifice. In fact, the only thing you'll have to bid farewell will be the gas station. 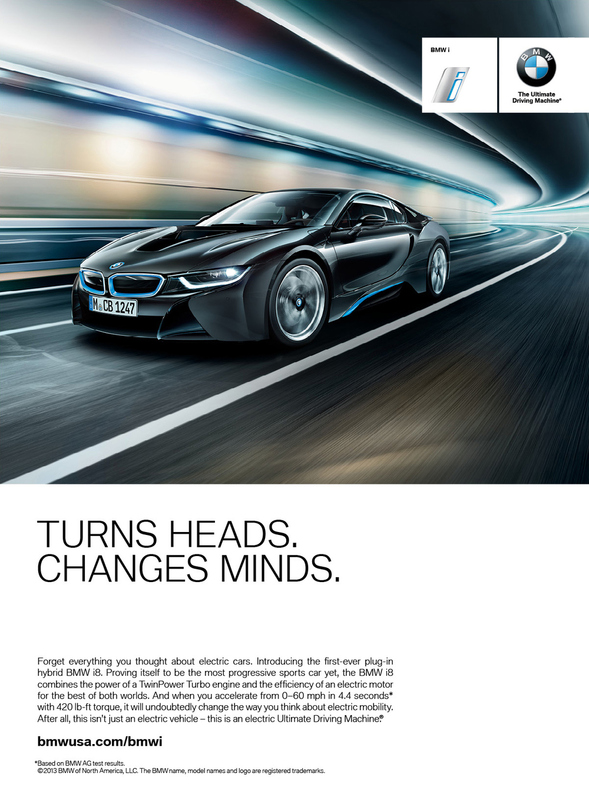 Here's a series of six print ads that ran in GQ that helped launch the BMW i3 and raise excitement around the arrival of the BMW i8 – not that the BMW i8 needs much help. In the style of a countdown to the future, this unique homepage takeover introduced NY Times readers to the world of BMW i. Visitors could further explore the BMW i3 layer by layer, gaining even more information about the vehicle and its innovative construction. The entire site experience can be found by clicking here. This will be especially helpful if you want to study up on all things BMW i.